Gregory Van Hale, M.S., D.D.S. During the 1950's and 1960's, dentists for the most part worked with the patient alone. The dentist operated on the patient and recessed while the patient cleaned away the debris by rinsing his mouth into a "bowl". Once the patients mouth was clean, the dentist continued his activities. As dental technology improved, it became necessary to include a second pair of hands to assist the dentist and the concept of "four handed dentistry" became popular. Today, four-handed dentistry is almost mandatory in terms of assuring proper support and competence while performing dental operations on patients. Because of rising costs, however and problems in finding proper assistants, it has become more and more difficult to achieve and maintain a steady flow of productive effort based on four-handed dentistry. The scheduling of office visits is often affected by the availability of the dentist's work force. A lack of effective assistants disrupts the desired flow of productive work. Working with patients, however, with or without an assistant, is paramount to maintaining the productive effort and job satisfaction for which dentistry is loved and respected. It is for this reason that I established DRDC-Dental Research and Development Corporation- an entity with the goal of production and promotion of ideas and inventions I've developed over the 17 years to improved production, efficiency, and job satisfaction for dentists. The primary motivation for DRDC is to reduce dental overhead and increase the productive efficiency of the professional through technical development. On this basis, dentists will profit without increasing their fees or increasing their requirements for auxiliary personnel. One technique that will achieve this goal is utilization of Aspiration Technology. Aspiration Technology is a technique that combines the supporting activity of the dental assistant with the professional operation of the dentist. It provides four-handed capability without utilizing a second pair of hands. In so doing, it reduces dental overhead by at least one-third, permits increased profitability and productivity without the need for additional staff. 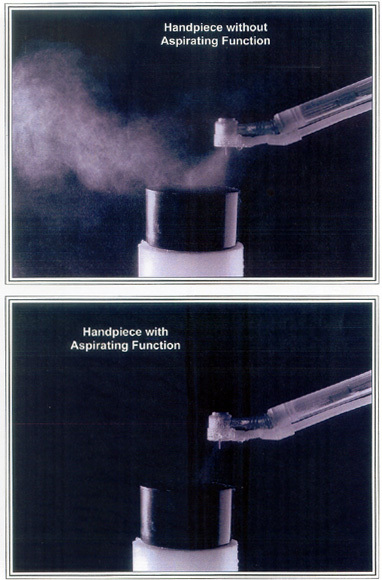 A second benefit of Aspiration Technology is more effective containment and control of aerosols generated in the dental field due to the operative techniques being performed. Aerosols containment is especially important in environments where large-scale dental activities are underway, such as dental schools, State Board examinations, etc. Aerosol containment is just as important in the private dentist's office due to increased awareness and concern by patients regarding the inhalations of pathogens such as tuberculosis, pneumonia, mercury, and so forth. Although improved containment of aerosols is recognized benefit of the application of aerosol technology, the major reason for my decision to commit time and resources to DRDC's technology development relates more to providing two-handed dentistry with four handed capability. These efforts were the culmination of many exasperating and worrisome appointments with patients where auxiliary staff members or dental assistants did not report for work. Whereas I could handle this on an occasional task basis, what was I to do if this were to happen frequently? Should I call a temporary staffing service and jeopardize the possible loss of my patients trust while indoctrinating a substitute in my style of practicing dentistry? For how long and how many times should I expose myself to this potential hazard? Would my staff serve my colleagues and myself and my patients better by concentrating on instrument sterilization and pre-set up operatories rather than standing beside me holding a high volume evacuator? For these reasons, I decided it was worth the effort to come up with an alternative solution. I recognized that we needed four-handed dentistry, but because of rising costs and complications in the labor force, we need to adopt a level of automation that provides four-handed capability without the second pair of hands. Aspiration Technology is my solution.